When it comes to extreme weather events, hurricanes and wildfires tend to grab the most attention, but there’s another natural beast causing billions of dollars in damages every year in North America alone – hailstorms. The Insurance Institute for Business and Home Safety has predicted 2018 to be the 11th consecutive year in which severe-storm related damages could exceed $10 billion in the US – and 70% of those losses are expected to derive from hail events. Colorado has been described as “a hotspot for hail” by Kristen Rasmussen, an assistant professor at Colorado State University, as the state has the perfect conditions of high altitude and dry air. Just last week, hail injured 14 people in Colorado Springs and killed at least fives animals at the city zoo. It’s not a peril to be ignored. “Hail has been an issue in Colorado for as long as I can remember,” said Dave Mellinger, agent and owner at Springs Insurance Brokers in Colorado Springs. “This was the first year in a long time that we did not have a lot of hail in the early season. Then in the last month we had two large hail claims that made it a regular season. I wouldn’t say there has been a steady increase in the frequency and severity of hail-related events – some years are better than others. Golf ball-sized hail pelting down on personal property can result in all kinds of damages, from roof problems to smashed windows. Insurers also see an influx of comprehensive auto claims during hail season, Mellinger explained. 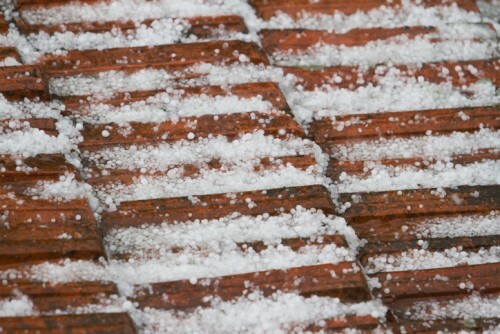 It’s a tough market, but there are some tips brokers can provide to help their clients mitigate hail-related losses.